Each year, around 150,000 people have a stroke in the UK. 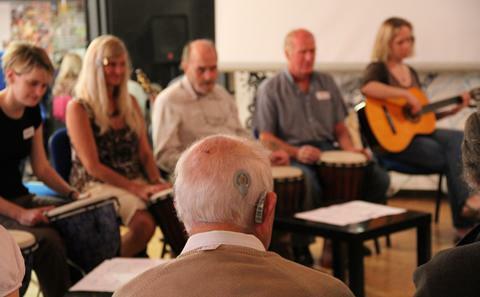 Stroke rehabilitation leads to a financial impact on society: it currently consumes around five per cent of the total budget of the NHS, as well as affecting individuals, their carers, friends and family. Southampton research teams are developing and trialling new wearable technologies to help people who have had a stroke regain the use of their hand and arm, and to practise movements at home that will speed up their recovery. 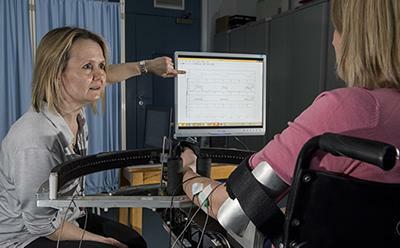 Jane Burridge, Professor of Restorative Neuroscience in Health Sciences, is leading a team developing a wireless sleeve that will provide automatic, intelligent information about muscle movement and strength while patients carry out every-day exercises at home. The idea of the technology, known as M-MARK, is to motivate people to practise and to give them feedback, not just on the amount of exercise they are doing, but also the quality of their movement. “This is something patients have told us they would find valuable,” says Jane. M-MARK consists of a sleeve with embedded sensors that detect movement and muscle activity. Using complex algorithms, the information from the sensors is relayed back to the patients, through a tablet computer. As well as giving them feedback on their movement, it will give guidance on simple exercises to do in the home. This data could also be sent to the hospital so the therapist can see the patient’s progress. The team is using mechanomyography (MMG), which detects the vibration of a muscle when it contracts, essentially like a microphone listens to sound. The advantage of this technique over electromyography (EMG), the technique most commonly used to measure muscle activity, is that no electrical contact is needed between the sensor and the skin. The Southampton researchers are working in collaboration with two industry partners – medical device development company, Madison and electronics company Tactiq – as well as Imperial College London and two hospitals: North Bristol Hospitals Trust and Portsmouth Healthcare Trust. This collaborative approach will enable the team to fast-track the technology to benefit patients in around two years’ time. The project is funded by the National Institute for Health Research, under its Invention for Innovation Programme. A multidisciplinary research team led by Dr Kai Yang in Electronics and Computer Science is also developing a wearable technology to help people who have had a stroke to move their hands and arms more effectively. The team is designing a sleeve with embedded sensors and functional electrical stimulation (FES) arrays. The sleeve will generate electric fields that stimulate the motor neurones and activate the muscles that the wearer needs to perform everyday tasks. Dr Ann-Marie Hughes, Associate Professor in Rehabilitation Technologies in Health Sciences and Dr Chris Freeman, Associate Professor in Electronics and Computer Science, have been developing the technology behind the FES device for the last 10 years. Kai and colleagues Dr John Tudor (Principal Research Fellow) and Professor Steve Beeby in Electronic and Computer Science, have been developing the printed e-textile for eight years. This has led to a prestigious £1.1m grant from the Medical Research Council to develop and trial their prototype with the end-users. The device consists of the sleeve, or armband, embedded with FES electrode arrays and a wireless electronic control system, software that the patient can upload onto a computer and a sensor that detects the arm movement. So how does it work? “The patient plays a video game that gives them arm movements to practise; the sensors detect this arm movement and feed this information back to the computer software. Our mathematical algorithms then adjust the stimulus parameters to provide precise electrical stimulation to the muscles, enabling the patient to make a very accurate movement,” says Chris. 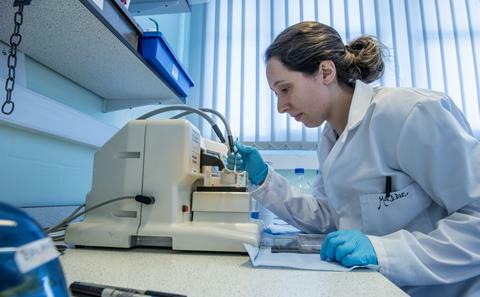 The research team is the first to put these types of electrodes into wearable fabrics, and is using the printing facilities in the University’s state-of-the-art £100m nanofabrication centre. The team is also working closely with stroke survivors, industry, healthcare professionals and charities such as the Stroke Association to ensure that what they develop is what the market needs. “We are informing people about our research and inviting anyone who is interested to get involved and help us build a community focused on improving arm rehabilitation,” says Ann-Marie. A quarter of people who have a stroke are of working age, so improving the use of their arms is important to help them get back into the working environment. The technology could also be used by people with multiple sclerosis, partial spinal cord injury and conditions that cause muscle weakness in older age – and even for astronauts working on the International Space Station for long periods, who need to exercise their muscles.